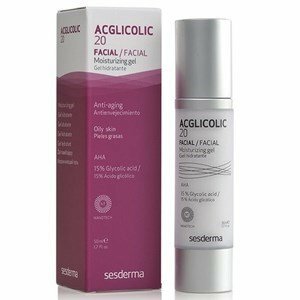 Acglicolic moisturizing gel with glycolic acid which exerts anti-aging action ideal for combined to oily skin with acne tendency and skin already accustomed to treatments with glycolic acid as the case of the Acglicolic Classic line. Glycolic acid exerts an anti-aging action, stimulating collagen synthesis, refirmando and softening the lines of expression. The functional balance of the skin is restored and the lines are softened. The dead cells of the stratum corneum of the skin are removed, smoothing the skin. The composition of this careful moisturizing, allows to restore the functional balance of the skin, enhance the synthesis of collagen and elastin, promoting adequate protection against aggressive external agents. This caution should be used as a treatment in people accustomed to glycolic acid. Apply on the face in soothing massages until its complete absorption. Suitable for combined to oily skin with acne tendency.